Andy Small has brought us an interesting collection of images of weathered steam engines. The book will be most useful for modellers of the transition era when the remaining steam engines were badly maintained and frequently in dreadful condition. The book is a photo album rather than a detailed guide to technique. Each page has three illustrations; The top one is a photograph of the featured engine, followed by two enlargements of particular areas. If you aspire to create realistic models of steam locomotives the high quality illustrations will provide a great source of information. In particular where to weather and how much dirt and grime to apply. 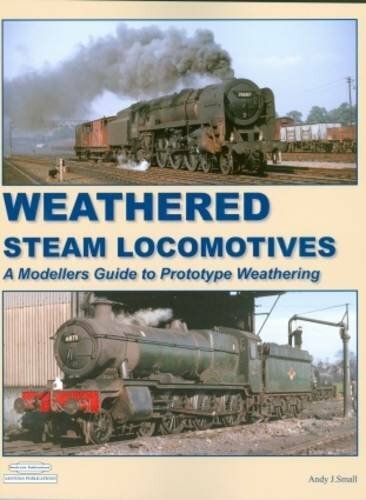 Certainly a good book to have on the workshop shelf, but if you need practical guidance on how to weather I’d supplement this book with George Dent’s detailing OO gauge steam locomotives . Weathered Steam Locomotives features photos of British locomotives, however the book is useful for modellers of any continent, and the commentary is universal. Not sure I’d pay full price for this one, but if you can get it at a discount its a worthwhile purchase.